Ask a Neuroscientist: What’s it like to have Broca’s or Wernicke’s Aphasia? “My questions suppose that with damage to the Broca area you would be unable to speak, and damage to the Wernicke area you would be unable to understand language. So if I’m wrong about that then my questions might not make sense, but I hope you can answer. Thanks so much for your question! In order the best address this, it’s important to first address how aphasias (meaning language disorders) are categorized. Both Broca’s and Wernicke’s aphasia impact the patient’s knowledge of language, as opposed to other aphasia’s that influence peripheral mechanisms that control language production. Broca’s aphasia is also called expressive aphasia, due to the patient’s inability to produce language. This often means they are incapable of producing grammatically correct sentences, and thus have extreme difficulty expressing themselves coherently. And while stroke is the major cause of aphasia’s, meaning that the available videos tend to show older individuals, a 2010 youtube video of teenage stroke survivor Sarah Scott, is perhaps the best illustration of the language deficits that characterize Broca’s aphasia. In other words, Broca’s aphasia affects the core components of language, which explains this parallel deficit across modalities. 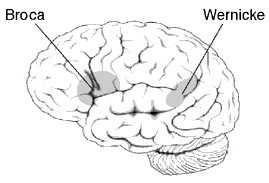 Wernicke’s aphasia, also called receptive aphasia, is a problem understanding meaning. This manifests itself as patients having trouble coming up with the right word, forcing them to call a dog “the thing that barks,” for example. They don’t have an issue producing the words they do use, as is the case for Broca’s aphasics (i.e. their speech appears smooth). In the youtube video below, stroke survivor Amelia Carter illustrates the language deficits common in Wernicke’s aphasia. One note: at the end of the video, you will see the interviewer ask Ms. Carter to complete the song ‘Mary Had a Little Lamb’; patients with Wernicke’s aphasia are usually perfectly capable of both understanding, and repeating songs, as you will observe in the case of Ms. Carter. In fact, melodic intonation therapies have been used during aphasia rehabilitation. Since both Broca’s and Wernicke’s aphasia have to do with disorder of the core of language, it is interesting to think about the modalities these disorders extend to. With Broca’s aphasia, it is clear that the disease occupies both the verbal and written modalities. However, it is more difficult to pin down an answer to the question of exactly how (and if) the modality of ‘thinking’ is altered in patients with Wernicke’s aphasia. For more information on aphasia research, visit Nina Dronkers’ lab page. Ardila, Alfredo. “A proposed reinterpretation and reclassification of aphasic syndromes.” Aphasiology 24.3 (2010): 363-394. Konnikova, Maria. The man who couldn’t speak – and how he revolutionized psychology. Literally Psyched, Scientific American. Link.